Washington, D.C.–The Center for Biological Diversity and the Maunabo Development Committee today filed a lawsuit under the Endangered Species Act (ESA), seeking protection for the coqui guajon, also known as the Puerto Rico rock frog. The suit was filed in Federal District Court in Washington, D.C. and seeks to compel the U.S. Fish and Wildlife Service (FWS) to designate Critical Habitat and prepare a Recovery Plan for the coqui guajon. 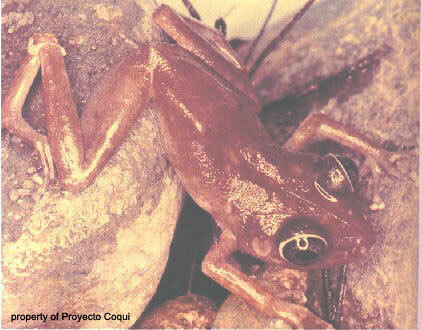 The coqui guajon (Eleutherodactylus cooki) was listed by the FWS as Threatened under the ESA on June 11, 1997. The FWS declined to designate Critical Habitat for the guajon at that time and has not done so subsequently, directly violating the ESA. Additionally, the FWS has failed to prepare a Recovery Plan for the guajon, also a violation of the ESA. The coqui guajon is a rare frog which occurs only in Southeastern Puerto Rico, in the municipalities of Maunabo, Yabucoa, San Lorenzo, and Humacao. The guajon occurs in caves and rock grottos known as ‘guajonales.’ The guajon is the only one of the Puerto Rico coqui species to occur in caves and grotto formations. There were originally sixteen coqui frog species in Puerto Rico. Three are believed to be extinct today and many of the remaining thirteen are believed to be rare or declining. Coquies are much revered and beloved in Puerto Rico. Coqui artwork and testimonials to the importance and majesty of coquies are ubiquitous throughout Puerto Rico. Critical Habitat is defined under the ESA as “areas essential to the survival and recovery of a species.” Critical Habitat is afforded to endangered species under the ESA and its designation is mandated under the ESA. Critical Habitat only applies to federal lands or projects on private lands that require federal permits, funding or licenses. Critical Habitat does not change land ownership or create a preserve on private lands. Critical Habitat does prevent the U.S. Government from funding or authorizing projects that would “destroy or adversely modify” Critical Habitat areas. Recovery Plans are plans designed by the FWS to bring about the recovery of a species to the point where its listing under the ESA is no longer necessary. Recovery Plans are detailed action plans which seek to bring together different agencies and parties in a comprehensive planning effort. The preparation of Recovery Plans is mandated by the ESA. The Center for Biological Diversity is a science-based environmental advocacy organization that works to protect endangered species and wild places throughout the world through science, policy, education and environmental law. The Center is headquartered in Tucson, Arizona. The Maunabo Development Committee is a citizen’s group that works on coastal and wildlife protection and environmental education. It is based in Maunabo in Southeast Puerto Rico. The guajon (Eleutherodactylus cooki), is a relatively large frog, approximately 8.5 centimeters (3.3 inches) in length. It is solid brown in color, although attending and calling males may have a yellow throat. The species is characterized by having large truncate discs and by a peculiar, melodious and low voice which is completely different from any other species of Eleutherodactylus in Puerto Rico. The guajon, first collected by Chapman Grant in 1932, is known only from the Pandura range in southeastern Puerto Rico and west to Patillas/San Lorenzo where it lives in crevices and grottos in and among boulders. Such grottos are commonly referred to as guajonales. It is from the grottos or guajonales where the species lives that the frog derives its name, the guajon. The species is limited in distribution by the rock formation where it occurs. E. cooki is endemic to Puerto Rico and is extremely restricted in geographical distribution. Threats to the species include deforestation, industrial development, run-off from the use of pesticides and fertilizers in agriculture, and the use of caves as garbage dumps. Worldwide amphibian populations have continued to steadily decline at about 2% per year after sharp drops of 15% per year from 1960 to 1966. Amphibians are considered an important indicator of environmental damage. Scientists attribute the causes to a combination of factors including the loss of habitat, fertilizers and pesticides, atmospheric pollution, and introduction of exotic predators.